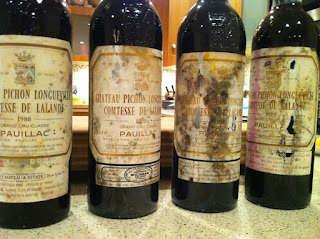 Not long ago I had the opportunity to drink four bottles of very fine Bordeaux, wines by Château Pichon-Lalande. A good friend was in NYC for the weekend and he brought these from his cellar - lucky me! I've had mature Bordeaux before but one bottle at a time, and quite infrequently. This may not surprise you, but I don't have any old Bordeaux in my cellar. Here's another thing that might surprise you - I truly wish that I did. There are few wines that could be considered less hip and cutting edge than Bordeaux right now. And rightfully so, in a way. The modern wines tend to be over extracted fruit bombs with little to offer in the way of terroir articulation, never mind detail or elegance. They are big, artificially made wines, in most cases. And they are hugely successful, making tons of money for everyone involved. But like most things that are classic, old Bordeaux is classic for a good reason. They are made from noble grapes and come from interesting terroir, and when well made they combine brawn with detail, complexity, and grace. Many wine lovers of my generation and younger may not have had a great old Bordeaux - it's not something that gets much attention anymore. I think that those of us who haven't had a great old Bordeaux are missing out, not only on beautiful experience, but also on a vital piece of wine appreciation and history. How can we even approach having an understanding of why wine is great without knowing what a grand old claret tastes like? 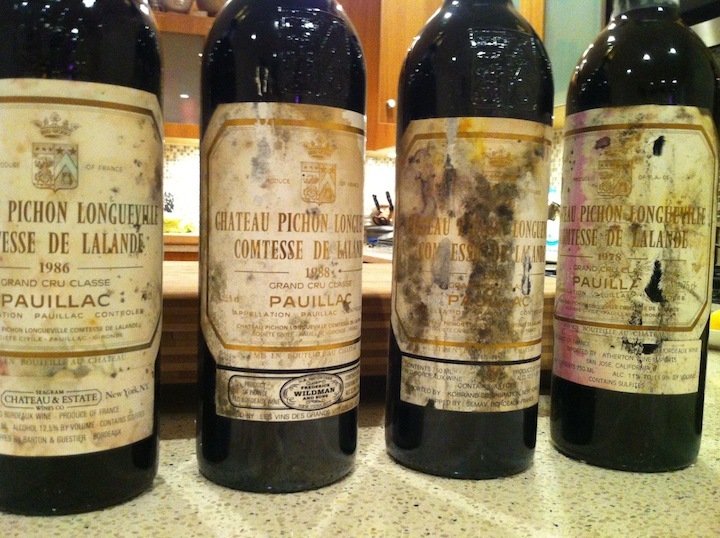 Pichon-Lalande is one of the top second growths, and comes from Pauillac, a terroir that apparently gives some of the brawnier wines of the region. You can almost see this in the color - look at that inky purple! My friend generously brought wines from 1978, 1985, 1988, and 1989. Although the youngest was 23 years old, none can really be considered old by Bordeaux standards. My pal Peter says that you shouldn't bother opening good Bordeaux before it hits 20 years old, and that's probably just the beginning of its maturity. I roasted a leg of lamb over potatoes, and we went to town. The wines were amazing, all four of them. They continued to evolve over many hours, and were delicious and deeply satisfying throughout. In general, I appreciated the raw power of the wines, and this was easy to do because they also showed such detail and complexity. There was power, but that was only part of the package. There was also balance - these were wines that showed lovely and refreshing acidity, and great complexity of aroma and flavor. Inspiring, really. Not in the way that I felt like going out and buying the current vintage, because as I understand it, the new wines will not become like these wines, even with 25 years in the cellar. They are made differently now. But inspiring nonetheless. 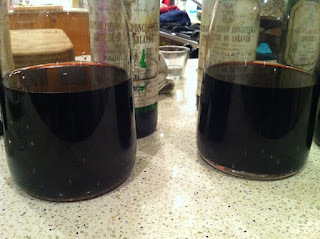 If you have any old Bordeaux and you want some one to appreciate it with, I will make dinner. The 1989 was a wonderful wine, Peter said that it was the grandest wine of the four, and that it had years, maybe decades of life in it. It was the most complete wine on the table, but I found it hard to compare the wine from 1989 to the wine from 1978 - I just don't know enough to be able to understand where the 1989 is in the context of the evolution of Bordeaux. Will it shed some weight and feel like the 1978 in 10 years? Will it always feel this full bodied, but become more gentle and mellow, and offer even more complexity with further maturity? I would guess, yes. I found the 1978 to be the most rewarding on this evening, with its mellow and gentle nose of tobacco and leather, its complex and long cedary finish. It felt like being inside a log cabin in the woods. 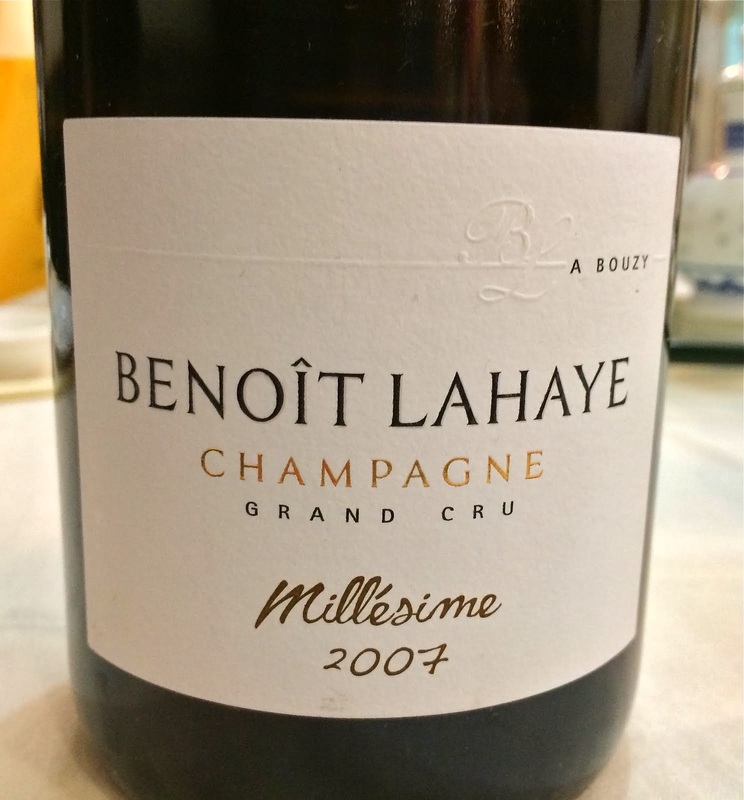 Still plenty of energy, an elegant structure, very long and plain and simple - absolutely delicious. The 1985 was the most approachable right after we opened and decanted the bottles, and was perhaps the most fruit forward of the wines. I enjoyed it tremendously, but in the end we found the other vintages to be more compelling. The 1988 felt more mature than I might have expected, but in a good way, and showed ripe fruit that was thoroughly infused with earth. I loved this one in particular with the lamb, and it seemed to have a lot to offer even as we finished it. This one might, sneakily, be a wonderful wine. There are plenty of reasons to ignore modern Bordeaux, I get it. The wines can be bombastic and overbearing, and the story of the Bordeaux region seems to be one of opulence and privilege, there is no struggle, no individuality. People in meticulously hip Brooklyn restaurants want to drink wines made without sulfur by scruffy guys or gals living in ramshackle trailers on lonely hillsides. Those wines have their place, I guess. But that's not Bordeaux. But there is something to this, to old Bordeaux wine. Don't believe me? Get your hands on an old bottle by a good producer - you and three of your friends can do this and spend less than $50 per person. And really, this is history, and it's worth knowing for yourself. Would you ignore The Police because Sting was kind of lame later in his career? Would you dismiss Woody Allen because Scoop kind of sucked? Are you not going to drink the one bottle of 1976 Lynch-Bages that Chambers Street is selling for $115 because 2010 Lynch-Bages costs $150 and will never be as good? Seriously, what kind of person are you, anyway? Kermit Lynch often reminisces about pre-1982 Bordeaux, when the wines still had bite. Yet I've also had some great claret after this vintage. Besides some of the famous châteaux, I can think of Monbrison or Haut-Bailly. In general, Parker helped influence the trend to riper fruit and tannins. Many producers therefore began to use reverse osmosis and later micro-oxygenation. It should be noted, too, that Bordeaux has less well-known châteaux and appellations, especially on the Right Bank, near St.-Émilion. Great line up of Bordeaux. grand Bordeaux . In my opinion these wines show the terroir that you mention as missing in todays modern versions. wines which exhibit real terroir and typicity, wines which they cannot even give away. The world of the Petite Chateaux is the real exciting area of the region that everyone who enjoys drinking Bordeaux should investigate. Real passion wines with charm & style. The true antithesis of the Classified Parkerized Bordeaux. Congrats for daring to say something nice about Bordeaux, which as I understand it is dangerous for a wine writer who wants to maintain their hip credentials. But how many times do you have to dump on current Bordeaux before you get to say something nice about older Bordeaux? Is there some kind of union requirement in the natural wine crowd to maintain a 5-1 insult to compliment ratio for Bordeaux or something? I get an odd feeling that you have actually not tasted a real range of contemporary Bordeaux and are simply passing along a conventional wisdom among Brooklyn wine afficionados. To be clear, some contemporary Bordeaux match the stereotype. But some don't, and even for some of the more concentrated ones I don't think anyone knows exactly how they are going to age. For some wines, the tag that they are overripe and will not develop in the bottle is likely true. For others, I think we really have no idea. My 2000s seem to be developing as one would expect -- powerful when young, they are closed up and tannic now, as Bdx often is during the 7-15 year period. To say that wine aging is mysterious almost understates the situation; there is no scientific understanding of how things like fruitiness when young affect the wine in maturity. We can look back to very hot vintages like 1990 and some of those wines are wonderful today (others not so good). One thing is clear: although today's Bordeaux are more accessible young many also have massive tannins lurking behind the fruit. Will they go out of balance or age in an interesting way? We'll have to see. Bordeaux still has lots of superb, world-class classed growths in the $50-100 range. Then there are petit chateau like Lanessan and the like. If you know what you're doing it offers at least as good value as Burgundy. And since many hip 'natural' wines are escalating past $25 into the $30-40 range I don't think that we can say that the price/value gap will necessarily always run against Bdx. I get it...nobody likes the snotty chateau owners and their proclivity for vintage hype and manipulating prices. People don't like the stereotype of Bordeaux drinkers either. But I really get the feeling that a certain amount of the criticism is more about what's on the label than what's in the bottle. There are also plenty of producers who are still making old school, or at least relatively traditional, balanced wines today. Figeac, Canon, Haut-Bailly, Dom. de Chevalier, and Branaire come to mind, and honestly Pichon-Lalande is also still making good wine--even John Gilman likes it. Pichon-Baron, too, the 2010 is great. On the more reasonably-priced end of the scale, there's Latour-Martillac (post 05, when they fired Rolland), Chasse-Spleen, Poujeaux, Angludet, and loads of others. I'm sure you're right, Marcs, that geeks now overlook a lot of righteous Bordeaux. 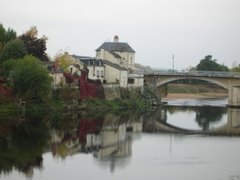 But that has its good side as well, since folks have discovered so many other European wine regions. The pendulum will inevitably swing back some (especially with Parker in eclipse), but it may result in a more balanced and integrated market for the smaller farmer-producers. Wow, I had no idea people are so down on the modern Bordeaux. My husband and I drink a lot of it, and enjoy it quite a bit. But I guess we're biased because we sell wines from that region. Then again, we only sell it because we love it, not because it's Bordeaux. Looking at all of your wine choices, I'm guessing our selection from Bordeaux might be too young for you, but nevertheless, delicious in our humble opinion, because we focus on the wine makers who still stick to traditional wine making methods. Please take a look at our French wine selection. 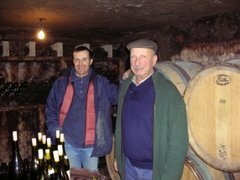 I think you'll enjoy the stories we have about each of the wine makers as well. And if you're feeling really adventurous, you might even want to go the way of Portugal. The Portuguese wines are can be quite exciting, but not to the point of being bombastic. Our favorite Portuguese wine maker is Rita Ferreira (who actually received us in her house), and she truly lives the life of someone who eats, sleeps and breathes wine-making, one that is simple, rustic, and disciplined. I agree with the posters above that wine is truly about what's in the bottle. Cheers! But it's hardly as though only the "great" wines of Bordeaux age well. I've recently drunk an 88 Ducru, a 94 Finca Valpiedra Rioja Reserva and an 88 Benziger Sonoma Mountain Cabernet. The Ducru came in third. I struggled for years to persuade myself that I really enjoyed these massive "fruit bomb" wines. The alternative was to admit that I lacked the capacity to become truly "sophisticated." Silly boy. The scales finally fell from my eyes when I was treated to a 13 year old Mondavi Reserve at the winery. To remove any doubt about what a fully matured, well stored "fine" wine should taste like, I tried a 25 year old reserve Monticillo that had just been released by the winery. The cork was new, so I assume it had been bottled from the cask. This has served me well as a benchmark. All of the wines mentioned in my first paragraph would have been quite hideous upon their release, capable of causing serious gastrointestinal distress, if drunk in quantity. Drunk when decently mature, though, they can disappear from the bottle quite rapidly, if one isn't paying attention. Something has obviously gone awry with the current status of "wine appreciation" in this country. Another case of "follow the money," I suppose. I too LOVE the 1978 Pichon Lalande Pauillac. Looking for a reasonable priced 1500ml.